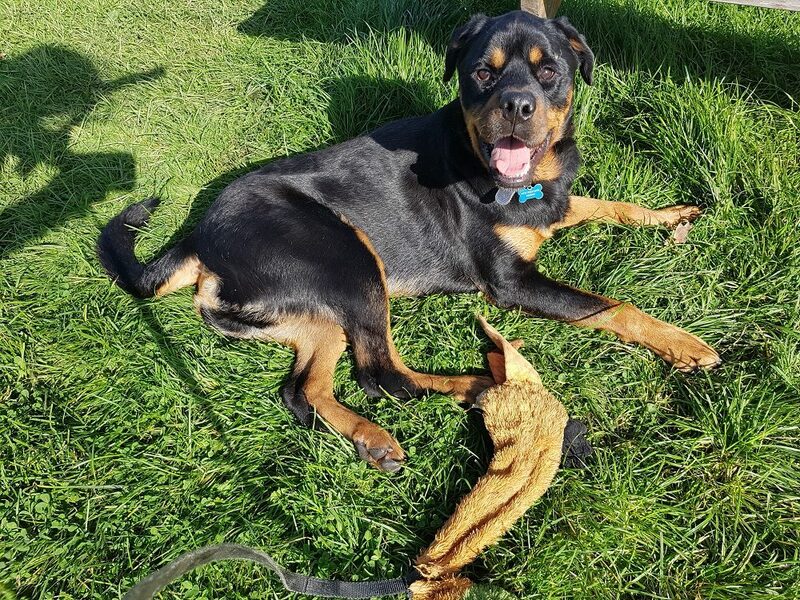 A two-year old Rottweiler is looking for a special home after being rescued by a brave nurse who spotted the distressed dog attempting to be sold by two men. When the animal loving nurse spotted the dog with chains around his head on her way home from work in London, she bravely stopped and approached the men offering money to let her take the dog who was clearly not well so she could get him to safety. She then found him a rescue space with Wellington based dog rescue, Rottie Friends Rescue where he could recover. After a year of rehabilitation and physio, he is now ready to begin a new chapter in his life, however, because of the trauma he has experienced he is looking for a very special type of home and the rescue has turned to dog adoption site, dogsblog.com for help. Angela Curtis from the Somerset based dog rescue says, “When Bernard arrived here he was under weight, weak and it was obvious that something was not right even though he had no visual injuries. After frequent vet trips and a referral to a specialist Neurology vet’s, tests revealed that he has Hydrocephalus. This is a condition that can be present at birth but sadly it is felt his abuse made this worse. “Initially Bernard did not have the jaw strength to eat solid food and everything had to be liquidized for him, but with physio and play this has improved and he can now eat good quality kibble. Veterinary surgeon at MedicAnimal.com, Andrew Bucher explained, "Hydrocephalus is a condition that typically affects puppies and is usually congenital, for example, it is present before or at birth. Alternatively, it can be acquired via an external influence such as head trauma, exposure to toxins, bacteria and viruses, cancer and Vitamin A deficiency. On Bernard’s health, Angela Curtis said, “Options were discussed at his Neurology appointment after his scan and the stent operation was felt to be too intrusive and recovery is lengthy and results vary greatly. Steroid treatment was tried for a month and had an adverse effect causing him to lose weight very quickly rather than put it on like most other dogs. “Bernard functions well with a set routine, good diet and physio and has regular check-ups." Bernard will need a home in the South West – Hampshire, Devon, Somerset or Cornwall. This is so adoptees can meet him frequently to get to know him before adopting. He will also need a home that has a large garden or land and space for an outdoor kennel or room that could be converted because dogs with Hydrocephalus drink frequently, they always need the toilet frequently especially at night time so a kennel and run are needed for night time and when out although he loves to come inside a house when supervised.dogs with Hydrocephalus drink frequently, they always need the toilet frequently especially at night time so a kennel and run are needed for night time and when out although he loves to come inside a house when supervised. Vet Andrew Bucher concluded, “Bernard's story is very touching indeed and I must say how amazing he is to have made such progress since being rescued. “Hydrocephalus in puppies can be quite variable in its prognosis but the fact that Bernard is not on medicines, making steady and continued progress with a set routine, good diet and physio is all very positive. “Bernard definitely needs an understanding pet parent but the signs do look encouraging for him to lead a happy and good quality of life with the correct support. One never knows the future of course but Bernard should be given the opportunity to find out."